Palouse Barley Fields, by Victor Szalvay. You might say I’m something of a late bloomer. At least, that’s how I feel sometimes. As a teen and through much of my twenties I was so hunkered down just trying to survive that I never really learned how to thrive. Still trying to figure that part out. In any sort of love story there’s the guy, the girl, and the problem—the thing that gets between the lovebirds. It might be a rival getting in the way. It might be a secret engagement, or a terminal illness, or (most often!) plain old miscommunication. In a sense it doesn’t really matter what “the problem” is. It just represents the possibility of love being unrequited, the possibility of being disconnected, lost, and alone. Except that they aren’t. Not at all. I’m blessed to date amazing women. Really, truly, I am always more impressed the more I get to know them. And not a single one of those things my gut tells me, is true about even one of them. They are fears, plain and simple, left over from a trauma long past, but intruding cruelly on the beautiful present. And so I’m left in the ironic situation where the closeness, the intimacy I yearn for is also the trigger of painful memories. We all want to be connected, to be close, to be in love, to love. I think it’s as vital to our souls as air is to our bodies. Without it, we suffocate. But sometimes we fear. Sometimes we’re afraid to breathe. One way to read the scriptures is that once we have perfect love in our lives, such as the love of God, then fear will be cast out. Another way to read it, though, is that casting out fear is a prerequisite for love. We cannot love until we cast that fear out of our lives. Until our ability to trust, to have faith and hope in God and others and ourselves, is greater than our fear. Until we accept that we cannot control every outcome, that we must accept risks, but that it is worth doing so. Do I believe this? Do I believe that the wonderful people in my life are worth the risk? Is it worth some small chance of the worst happening, to be able to join my heart with somebody wonderful and build something beautiful together? It’s a bit of a step into the darkness, I suppose. But once we’re willing to step into that darkness, we are no longer mastered by our fear of it. I think it’s worth the risk. P.S. 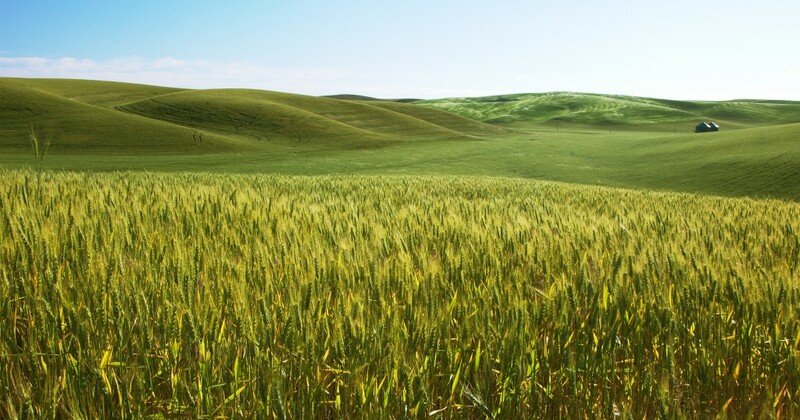 What do barley fields in eastern Washington have to do with anything? While I can imagine a deep metaphor relating Ice Age floods and agriculture to relationships, basically I felt this post needed some kind of a visual—any visual—and that’s what I came up with! This entry was posted in relationships on December 21, 2013 by Josh Hansen. I don’t think you necessarily need to cast out the fear as a prerequisite; Sharing that fear with the person serves the dual purpose of helping you overcome it and letting them know you a little better. Good point, Ben! I think there’s a place for both the casting out of fear and the sharing of it. We have to overcome the fear of sharing, at least, before we’re even able to share our fears. For me I think the important thing is to be careful not to let my fears from the past distort how I view people in the present. Everybody deserves to be treated as the person that they are rather than as a projection of our fears. By the way, sorry for the delayed response. I just moved servers and apparently hadn’t configured the comment notification correctly.